Topics: Compliance, Autocare Warranty, Credit Protection, Extracover, Maintenance Plan, and Service Plan. 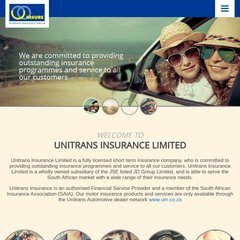 uinsure.co.za U-Insure Partners - U Insure is a fully licensed short term ..
uinsure.co.za Unitrans Service Plan - U Insure is a fully licensed short term ..
uinsure.co.za Unitrans Maintenance Plan - U Insure is a fully licensed short ..
uinsure.co.za Autocare Warranty (New & Pre-owned Vehicles) - U Insure is a fully ..
Its 3 nameservers are titan.is.co.za, demeter.is.co.za, and jupiter.is.co.za. Internet Solutions Johannesburg is the location of the Microsoft-IIS/6 server. The programming language environment is ASP.NET.